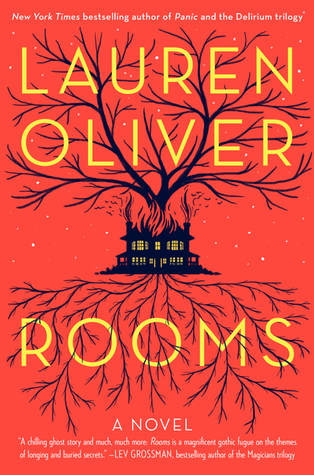 I've read Lauren Oliver's Delirium series and Panic, so I am well aware of her YA books. I knew this was an adult book when I tried to pick up a copy at BEA a couple of years ago, but I obviously forgot in the meantime. I downloaded the audio book and started listening to it on a road trip with my ten-year-old son and quickly discovered that it is NOT appropriate for younger readers. After a couple of "bad words" and some content he hopefully didn't understand, I had to pull the plug for the rest of that trip. Rooms is told from multiple character's points of view, which I found to be very entertaining. Alice and Sandra are both ghosts who were former residents of the home they "haunt", for lack of a better word. Richard Walker was the most recent owner of the home, but he recently passed away and his ex-wife, Caroline, teenage son Trenton and adult daughter Minna are there to settle his affairs. Trenton and Minna haven't been to their childhood home in years, so their return stirs up a number of old memories. In addition, Trenton was involved in a car accident prior to the start of the book that nearly killed him. He believes it was this near death experience that is causing him to hear ghosts in the house. Caroline, Trenton, and Minna are all battling their own demons, but hearing ghosts is even a stretch for them. The majority of the book is an unraveling of the lives of the ghosts as well as the living. There are a number of finely woven details that link the past with the present and several surprising revelations. I don't think I was quite as close to the edge of my seat as I was reading Panic, but this was still an excellent ghost store and a solid debut into the world of adult fiction for Lauren. The only negative that I perceived was the somewhat crude language that was dispersed throughout the book. I read a lot of YA and NA, so I'm definitely not used to it. Some adult content and language is fine, but I thought it was excessive in places and could have been toned down.